Photo: An all-time favorite well-being food, Bibimbap. Photos: ©KOREA TOURISM ORGANIZATION. Bibimbap, a bowl of rice mixed with meat and assorted vegetables, is one of the all time favorite meals of the Korean people, regardless of age or generation. Its popularity has also grown internationally with the spread of hallyu, or Korean “wave.” Even some Hollywood celebrities have praised its nutritional value and talked about how it has helped them maintain a healthy diet. What’s more, the dish can easily be prepared for vegetarians as well! Restaurants with various versions of the dish have been popping up in different parts of the world, and these creative adjustments to the dish give it an added visual appeal and taste, making them well-received by international customers. Thanks to its gaining popularity, bibimbap is now being intensively studied for menu development and researched for its nutritional benefits. 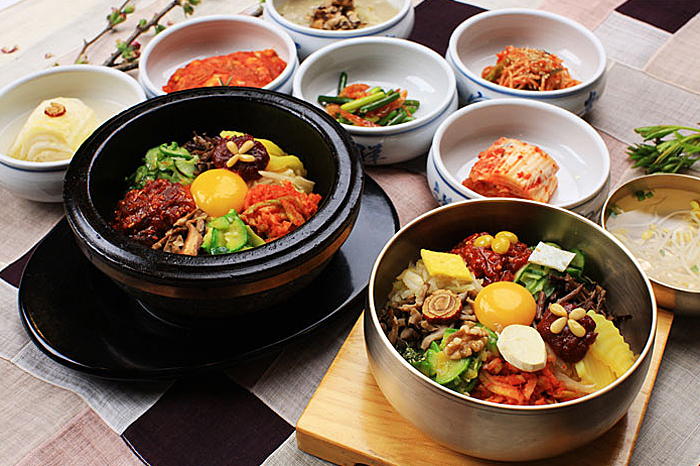 Let’s learn more about how bibimbap came to capture the hearts of so many. One might argue that bibimbap is a type of fast food, in the sense that it is all eaten together after being tossed and stirred thoroughly. However, it is actually the very opposite. 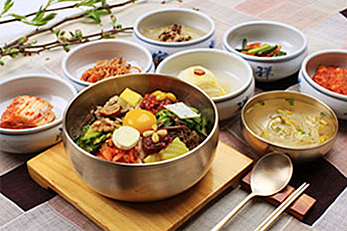 Unlike most fast foods, bibimbap contains many beneficial ingredients including both vegetables and meat. This also represents Korean’s long-held belief in harmony, created by oseak (the five cardinal colors of traditional Korean art). The colorful ingredients please the eyes while the savory smell of sesame oil tickles the nose once the vegetables are mixed with rice. Each bite provides a mouthful of bursting flavors of the sauce and the vegetables. The dish also provides the option of cooling it off before eating or having it served in a hot dish to maintain the high temperature. You may have seen a photo of bibimbap carefully prepared on a golden yugi (Korean brassware) or the heavy-duty dolsot (stone pot). Considering these characteristics unique to bibimbap, one can easily see that it is a thoroughly prepared meal that will not only aid your health, but also heal your mind. At this point, you might become curious about whether you always have to mix everything together, and the answer would be “yes.” The meaning of the word bibimbap goes back to the period from the 16th to 20th century, when it was first called goldongban, meaning “rice made by mixing various types of food,” and otherwise known as hwaban, meaning “flower to bloom on top of rice.” This colorful mix was then adopted by many regions throughout the Korean Peninsula, ending up in various types of these specialty bowls found today. Bibimbap today is far more advanced in terms of its variation, taking many different roles and forms for different occasions. For example, bibimbap to-go is highly appreciated in Korea as well as other countries, and you can find it anywhere from convenience stores to gourmet restaurants. Bibimbap is also featured in many international in-flight meals. 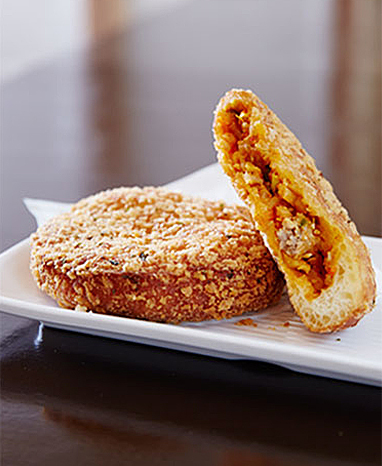 Jeonju Hanok Village takes fusion one step further by serving bibimbap in cups and making them into croquettes, and even inventing a bibimbap bread, in addition to the basic form of bibimbap served in lunch boxes. These can easily be eaten on-the-go, similar to the way a sandwich is convenient for eating while traveling. On the other hand, people who prefer fine dining and hope to delve more into genuine Korean tastes, try out gang-doen-jang (soybean paste sauce) bibimbap. For those who are not familiar with the strong scent of the sauces or ingredients, they can choose the level of spiciness. Jeonju bibimbap is uniquely prepared with an assortment of colors of namul (vegetable side dishes), and is regarded as the most representative example of bibimbap. Fried beef and thin garnish strips of cooked egg whites and yolks can be a good alternative to yukhoe (beef tartare) and egg yolk. The broth from a beef brisket is used to cook the rice, and is garnished with the tartare and egg pair on top, a signature feature of Jeonju bibimbap. It tastes even better with hot pepper paste mixed in with fried beef called yak-gochu-jang, the specialty of Jeonju, as well as bean sprout soup or beef radish soup. Heot-jesatbap is a combination of the words of hoet, meaning “fake,” and jesabap, referring to the meal that was served during ancestral rites. Confucian scholars in Andong, Jinju, and Deagu used to have this jesabap even when there was no ritual service, which is how its name became heot-jesatbap, inferring that it was a “fake” ritual meal. 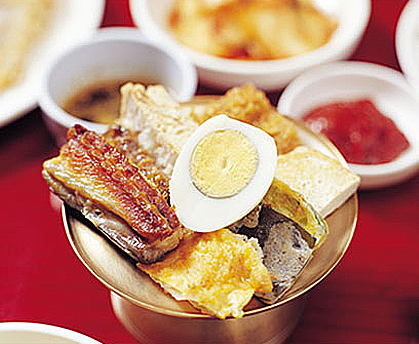 Andong is best known for its scrumptious heot-jesatbap, which is typically made with namul, jeon (coated and pan-fried fish and vegetables) and guk (soup) from the table for ritual services. Usually three different colors of namul are served on the top of the rice. Since jesabap is served in remembrance of one’s ancestors, the main spices of Korean cuisine, such as spring onion, garlic and red pepper powder, are not used. Also, the ritual dish is served with a variety of jeon and sanjeok (skewers) made with dombaegi (“shark meat” in the local language), mackerel, and beef. 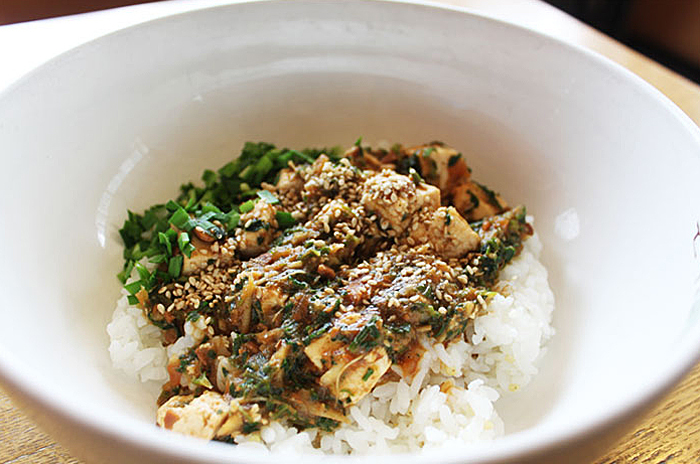 Unlike other bibimbap traditions, diners may adjust the flavor of individual servings by adding soy sauce, sesame oil and its seeds, instead of red pepper paste. It tastes even better with tang-guk (beef and radish soup), a soup flavored with dried sea cucumber, octopus, seaweed, and sliced radish, all of which are diced into pieces and thrown into a clear broth. Tongyeong, a coastal community, has an abundance of fresh seafood, making it the best feature of Tongyeong bibimbap. Namul and vegetables are served on steamed rice and then mixed with shrimp, clams, and mussels blanched in boiling water and seasoned with sauce. If this process is too cumbersome for you, you can throw all the namul and vegetables in a pan and fry them in a rich seafood broth. This dish goes perfectly with clams and tofu soup. Tongyeong is also known for sea squirt bibimbap. Jinju bibimbap is a unique local food of Jinju in Gyeongsangnam-do. It is served with vegetables including cooked fern brakes and bean sprouts on top of steamed rice. Then, minced beef and jang guk (clear soybean soup) is mixed in a bowl and served after being garnished with cheongpo (mung bean jelly), yukhoe (beef tartare), and red pepper sauce. Yukhoe is the symbol of Jinju bibimbap, but the cooked beef version is also served. 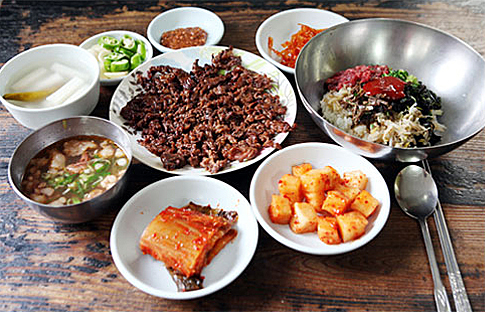 Yukhoe-bibimbap can be commonly found on the menu of restaurants in Jinju, which trace back to the 1920s, when Seoul and Jinju emerged as active markets in the cattle trade. 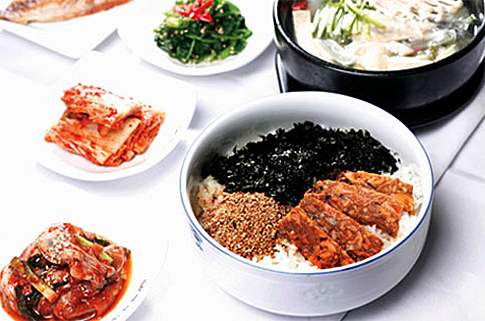 Bibimbap, being Korea’s representative food, played a huge role in making Korean cuisine famous worldwide. One of the best examples of when bibimbap crossed cultural boundaries was when the late singer Michael Jackson, according to media reports, enjoyed bibimbap meal after meal during his stay in Korea after trying the dish as an in-flight meal during the flight. Domestic and foreign airlines offer bibimbap with steamed rice, finely presented namul and spicy red pepper paste. Passengers can enjoy all the fun of mixing their ingredients together. The mildly spicy red pepper paste is also available to suit the taste of those not accustomed to it.